This project was done with my first graders over a period of 4 classes. It is a great way to introduce VERTICAL, HORIZONTAL, & DIAGONAL lines. Introduce directional lines- vertical, horizontal, and diagonal. I have the students use their arms in the air to show me the direction of each of these. Offer a variety of colors for the students to use in painting their lines. I chose to use up these autumnal colors from a previous project. I place two colors of paint on each table. With their papers in a horizontal position, they begin to paint, vertical lines on one paper, horizontal on another, and diagonal on the third, alternating the two colors of paint as they go. We also discuss farmers (we are in a very rural community) and how they plant and plow in straight lines, so they try to keep their lines very straight also. Tip for painting the horizontal lines: have them connect the corners first and then work outward from the center. It is much easier for them to comprehend this way! Once their "crops" have finished drying, have the students rip each paper in half vertically. I have my students hold their papers as shown below. I tell them to pretend they are Little Bunny Foo Foo holding thier basket. It works! Then, they make about a three inch tear from the top by bringing one hand toward them and one hand away. I use lots of modeling to demonstrate this. They will have a hard time tearing their paper if you don't take them through it step by step. To finish, they grab their paper by the sides and tear the rest of the way down. They keep oen half of their "crop" and the other half goes in our scrap box to be used for another project. To glue the "crops", have the students make a glue line along one of their papers, following the straight edge. This paper gets glued along the bottom edge of their "sky" paper. Because they have only glued the bottom edge, it has made a pocket, as shown below. The students choose another "crop" and again glue the straight edge. This paper then tucks in behind the previous "crop" paper. Be sure to point out that no sky should be showing between the crops! Finish by gluing the final "crop" paper behind the second. Students then add some glue behind all of the rows to secure them. 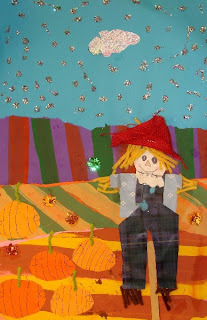 You will need a variety of "crafty" materials to make the scarecrow. This is a great time to use up those bits of yarn, scraps of wallpaper, and millions of popsicle sticks that have been dumped on you! I model, step by step on the board, how to draw the shirt on the back of their wallpaper scrap. Have the students glue their sticks on the paper. I have found that it is best to place it in the bottom row of crops and not too close to the edge. After cutting out their shirt shapes, these are glued about 2 fingers' height above the stick. This is important or the stick will not show out the bottom of their scarecrows. I then take them step by step through drawing the overalls of the scarecrow. I have a large scarecrow in the corner for them to observe also. These are glued on top of the shirts and straps are made from scraps. The head shapes are cut from tan colored wallpaper scrap. We discuss how farmers might make the heads from bags that are gathered at the neck. Also discuss the various shapes that make up the face: triangle for the nose, ovals for the eyes with a circle inside uncolored, circles for the cheeks. They use a ultra fine Sharpie to draw the faces on and use other markers to color them. The mouth is simply a smile with Xs on it to make the stitches. 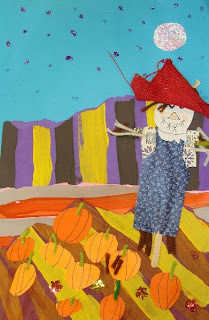 Students use scrap orange paper to make pumpkins and glue these on. 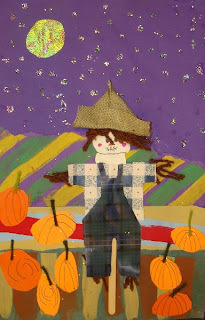 I remind them not to glue them above the scarecrows shoulder height or they will look like they are floating. We added lines with the skinny Sharpies and yarn bits made great stems. Moons can be made from any scrap paper that shimmers. Have students add shining stars in the sky by adding dots of glue and sprinkling glitter on top. If you can find them, little leaves may be added around the pumpkins. Yarn bits work great for the "stuffing" of the scarecrow. Simply have students glue some on the end of each arm & leg and on the head for hair. Finally, I have the students line up to get their hats hot glued on. 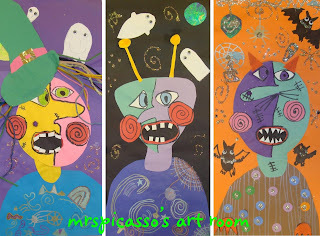 You can view our entire gallery of ScareDudes on Artsonia. Oh my goodness, This is adorable! I will keep this in mind for next year. LOVE this FUN project! It's too late for me to do this year - I'll have to remember it for next year! I love this idea! Very creative and fun! Wow - I love this. Going to try with my class for Harvest this year! Thank you so much!